Smooth-Cast fast-cast resin was developed specifically for adding color pigments and fillers to achieve true color representation or filler effect. 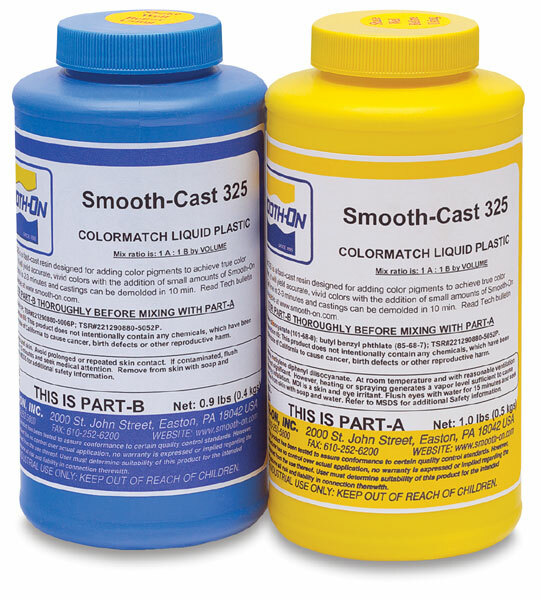 It is formulated to be "color-neutral," so that the addition of small amounts of pigment will yield accurate, vivid colors from cured castings. It has a convenient one-to-one mix ratio. It requires no degassing. De-mold times range from seven to ten minutes, depending on mass and mold configuration. Smooth-Cast is ideal for creating marble and wood grain casting effects, or for duplicating the look of real metal by adding bronze, brass, or other metal powder. Use it also to create pigmented prototype models or figures, special-effect props, small to medium sculptures, jewelry, and more. Shrinkage is negligible. The pack includes two 16 oz jars. Use a release agent to facilitate demolding.